You guys know I'm a fan of strange art. But THIS may be taking things a bit too far. 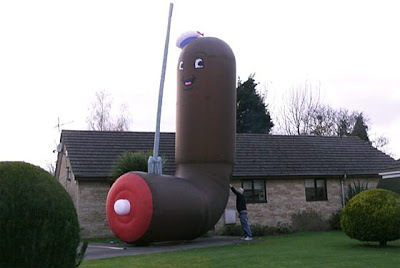 The giant sausage "artwork," created by a meat-loving team known as Kuildoosh, will soon be gracing the backyard of a Brooklyn art gallery. Right now, however, it's stuck in customs on its way from the UK. Perhaps we should hope it stays stuck? um... what even is it? It looks like a large double entendre. XD That is totally AWESOME! that's...well...umm..interesting. thats what it is. interesting!